Happy Holidays! I hope you have a fun and safe time filled with lots of great people and riding. I’m excited to share the above photo is the header image at Aerostich.com right now. They also sent it as a printed card. It is pretty great to see my work in print! Minnesota has been experiencing a heat wave the past week with temperatures in the high 40s F. Time for a motorcycle ride! Laura and I picked the Super9 to ride today. It was wheeled out from the garage and gassed up. I have to make my own premix of one part oil and 32 parts gasoline for it’s two-stroke engine. When I pressed the started button, it just turned over and over and over. It didn’t start. Much too soon, the battery was worn down from trying and the headlight wouldn’t light up. Darn. I put it back on the charger from which it came. I will have to investigate the charger. The SV650 to the rescue. It was a short 25 minute ride around the area. We visited a few lakes to see them free of ice. It is supposed to get cold and snowy again in a couple days, so this may be our last two-wheeled ride of the year. For the last couple weeks, it has been cold and snowy with the temps below freezing. I’ve been going to work as the sun comes up and returning in the dark. Not fun. Finally, the weekend has come! I slept in and awoke to the sun shining brightly. It was a nice lazy morning. While enjoying some blueberry pancakes and sipping a strong glass of chai, I saw a motorcycle ride by! I was surprised. I haven’t seen one on the road in weeks. Stepping outside felt like stepping into Spring. Even though it was only 40F, it felt much warmer. The sun had melted the ice and snow on the roads. My bikes were calling my name. With my gear on, I stood in the garage looking over the motorcycles trying to decide which one to take. I pondered taking the Super9 or the SV650. I didn’t have to think long. 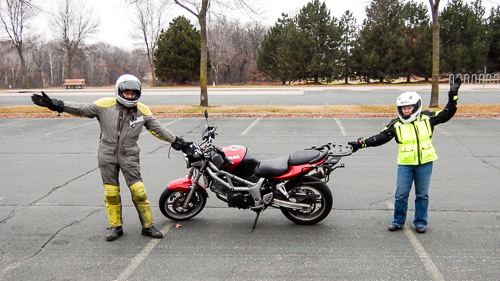 As you can tell from the photo, the SV650 won out. I pulled it out of storage and it roared to life on the first press of the starter button. It was a lovely sound that brought a smile to my face. It felt great to be back on the Suzuki. The growl of the vtwin and the punch of torque at the slightest movement of my right wrist. I rode all around my neighborhood checking out the road conditions and getting reacquainted with my favorite bike. It has been too long. I rode for about thirty minutes before I started to feel the cold. It’s been a couple hours now, and I am still smiling. I really love that motorcycle. I hope to be able to ride it again soon, but first I need to get on a plane to Iceland. Ride safe. We woke up early eager to get to the park and see Lake Superior and the waterfalls. After a quick breakfast of some awesome “mountain bars” I had made before the trip, we were off into the woods. The lake and park were a short 15 minutes ride. The Black River scenic byway is a quiet wooded road with great views of trees. There are numerous parking lots along the way with hiking trails leading off in all directions. The waterfalls are all clearly marked. Some are easier to get to than others. We rode to Lake Superior at the end of the road first. After crossing the bridge above over the black river, we were on the beach (above). The first waterfall we visited was Rainbow Falls. From the photos on the Internet, it looked great. The view from this trail wasn’t the best. After walking 1/2 mile and walking down what felt like 500 stairs, we arrived at the view below. It was still impressive, but it was hard to see the full view of the falls since we were at the top. Hiking around to the other side would have been nicer. The shot below is the view further down the river towards Superior. After a rest, we hiked back up the huge amount of stairs. Gratuitous motorcycle shot. It was awesome how green and peaceful it was in the forest. It had rained hard the night before, so all of the falls were full strength and there was a cool humidity in the air. The air felt very fresh and clean. A short ride and hike later, it was time for another waterfall which meant more stairs. Thanks to Laura for this shot of me walking down stairs. lol. My motorcycle boots made for good hiking boots. The next set of falls were much more open. Not nearly as tall as Rainbow. A shot of Laura to get a sense of scale of the place. We had it mostly to ourselves. We only saw two other couples the whole time we were exploring the different waterfalls. I think this one was called Sandstone falls. Another mini-falls further up along another trail. This one didn’t seem to have a name. The trails were great. Other than the massive amount of stairs, it was easy to walk around and check out the waterfalls. I really liked this stump for some reason. I still can’t explain it, but it just looked nice. The last waterfall we visited was Potawatomi falls which was the easiest to get to with only ten stairs! By this time my legs felt like jelly at the thought of more stairs. The view was totally worth it. We met a couple at this lookout point who said they were here the day before and the falls were only half full. The rain last night made a huge difference. We picked the right day! Much too early, it was time to start heading back home. We stopped several times along the way to pick up some treasures from the trip. We bought some local crabapple jelly and some plum jam. Both were delicious. The walnut oil is for a roasted carrot recipe I’m playing with. The flat stones came from the beach on Lake Superior. I hope to use them in my mason jar fermentation projects to hold the veggies below the brine. I haven’t been able to find such rocks near my house easily. Two of the four were perfectly sized. The other two don’t quite fit into the jars. It was a nice weekend away! We rode almost 550 miles over two days most of which was on small two lane roads in heavily wooded areas. It was relaxing. I am looking forward to our next adventure. Hoping to escape the heat of labor day weekend, we quickly planned a short motorcycle road trip to Lake Superior and Michigan’s upper peninsula. We lightly loaded up the SV650. One of the rack’s supports for the side bags cracked while I was in North Carolina last month, so we couldn’t put anything in the side bags. No, I don’t know exactly when/why it broke, just that it was on that trip. I only had the sidebags half full on that trip, so I had room to stash my gear during stops. For those keeping track, this has to be the fifth time now it has cracked. Always in a different spot too. Maybe this is why they don’t make this rack anymore. We left early on Sunday morning as soon as the rain stopped and headed north on I-35 toward Duluth and the big lake. It was a quiet ride along the freeway. We took frequent stops to stretch and look at the trees. We stopped on top of one of the hills to snap the photo above before taking the scenic drive the rest of the way into Duluth. I couldn’t resist getting a photo of Laura tweeting. We arrived in Duluth around lunch which we had at the local co-op. It was nice to relax and look at the lake while eating some good food. It was also starting to feel very warm. We headed East into Wisconsin on US-2 to skirt the bottom of Lake Superior. We had a brilliant view of the harbor as we crossed the very tall bridge. They pass ocean sized ships through there. We stuffed everything into a backpack, so no gopro on this trip to capture the view. While riding through northern Wisconsin, we passed through numerous small towns as the speed limit went bounced around. One of the small towns thermometers claimed it was 91F! So much for beating the heat! We eventually arrived in Ashland, WI. We originally wanted to stay there. It is right on Lake Superior and very beautiful. The Internet didn’t show any affordable hotels. We were a bit dismayed to see many cheap motels with the vacancy signs brightly lit. Dang. Ashland has claimed the “mural capital of Wisconsin” as it’s title. There are over a dozen very large murals on the sides of the buildings. All of the murals above came from Ashland. I enjoyed riding around looking for them. It was a fun scavenger hunt. The heat reduced the fun factor as we went. Time to keep riding. It wasn’t too hot to ride; it was too hot to stop. We crossed over into Michigan. It has been a while since either of us had been there. We booked a hotel in Ironwood just across the border. Ironwood on the border of the Ottawa National Forest which looked like it was chock full of waterfalls and nice hiking trails. Ironwood’s other claim to fame is this giant indian statue called “Hiawatha”. The sign claimed it was “The World’s Tallest Indian”. Made of all fiberglass it stands over 52 feet high and weigh 18,000lbs. It was constructed in 1964. It was massive as you can tell from our photo below. After riding for almost 350 miles, we were happy to retreat to the hot tub of our hotel. We did manage to explore the town some more to find almost everything was closed for the holiday weekend. No worries, we brought our own food. The other thing that surprised me about Ironwood was how cheap the homes were. We spotted many “for sale” signs while walking around. The average price seemed to be $15k-30k! Stay tuned for the second half of the trip were we go chasing waterfalls in the National Forest. Last Thursday was Motorcycle First Thursday, and you couldn’t have asked for better weather. The crowds were a bit slow to arrive. I am going to blame the horrible state of traffic with all the road construction and the upcoming holiday weekend. I still had fun looking at the motorcycles and chatting with friends. I think I might have featured the above before, I can’t remember. I still like the bike. The upside down Suzuki gets me along with the iridescent paint. “Built not Bought” I assume a custom frame since the engine clearly has the Suzuki stamp on it. This helmet is fun. The “void” sticker and the “Pay attention. What?” It made me laugh. Stretched scooter with a car tire? An electric Victory. Very cool! Victory bought Brammo earlier this year and is now producing the Empulse TT. I really want to test ride one. This guy might win for furthest ride to first Thursday this month. I think the guys from Norway I wrote about a few years ago win the overall. old Indian in decent shape. neat looking Yamaha. I love the wheels. A dirty Husky; just like a dualsport is supposed to look. Lastly a first gen SV650. I like the looks of this one. I also want his seat. I bet it is more comfy than my stocker! I woke up and checked out of the hotel early. I wanted to enjoy a day of riding twisty roads while everyone else was at work. My plan worked. The roads were remarkably empty on a Monday morning. I left Dubuque and started riding north towards home. The rolling hills and windy roads were very enjoyable. The farms looked so picturesque. I loosely followed the Great River Road through the driftless area. This area was supposedly not touched by glaciers and as such is more rugged with steep cliffs, bluffs, deep valleys. All of which mean twisty fun motorcycle roads. Then great views like this jump out at you. A shot of the Mississippi River looking north. Getting closer to the MN border. A nice bridge over to WI and a river boat. Many of the roads in this area have neat names like CY9 and X56 (two of my faves). They sounds like names for fighter planes instead of roads, and you sure feel like one carving around the sweepers. I took some time to explore a bit and found myself on a stretch of gravel road. The beginning was nice, but by the end it was large marbles. Not fun. The scenery made it worth while winding through a wooded valley to the farms on top of the bluffs and back down the other side. Hello Minnesota! It was nice to see this welcome sign. One of the first overlooks on the Minnesota side of the Mississippi. Bald eagles like to nest in this area. I didn’t see any this time, but have seen them on previous trips. More twisty roads and great views of the river bluffs. SE MN is one of my favorite parts of the state. So beautiful. Yup, this kind of view for over 100 miles. I stopped at a park near Lake City, MN for a picnic lunch. It was nice to get off the bike and relax for a bit before taking the final 50 miles back into the metro area and heavy traffic. My last day of riding was just over 300 miles most of which were on beautiful, empty, two-lane roads. I really enjoyed my short 2800 mile motorcycle adventure to pick off my 49th state and watch some amazing riders at MotoGP. Now that I am home, I am eager to go on another trip! Road Trip Day #6–More Mountains! Road Trip Day #5–Mountains FTW!